Why Aurifil Thread? Why do we love this thread so much!? Aurifil creates 100% cotton thread that is geared towards quilters. Made in Italy, the quality of the thread is made from long staple Egyptian Cotton meant to make your projects last and look amazing. The company was founded in 1983 creating thread for both commercial and domestic quilting. They began making it available for American quilters in 2007. Pink Castle Fabrics sells Aurifil thread both in store and online! Aurifil is known among sewists for its amazing strength while still being incredibly thin! The key to this strength is the long staple cotton. When you have longer fibers to make into thread, there are less joins and weak spots on the thread. The thread strength is enhanced again by the mercerization process. Here is a link to a great article about mercerization and what that means for your threads and fabrics. It helps the dyes to be brighter and last longer, it strengthens the threads and gets rid of the "fuzz" so you won't have the same halo that you notice when you use some threads for embroidery or cross stitch. 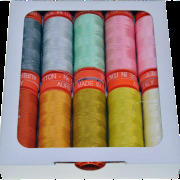 Aurifil threads come in several different weights or thicknesses. The bigger the weight number, the smaller the thread. Keep in mind how many plys (or how many strands are twisted together to make the thread) are used when comparing thickness between brands as well. A 50 wt (weight) thread with 2 plys will be thinner than a 50 wt thread made with 3 plys. Pink Castle Fabrics a good selection of Aurifil thread in several weights. 50wt that is perfect for machine applique, machine embroidery, piecing, and quilting. It’s also perfect for hand sewing (such as quilt binding), too! It comes on three different sized spools: small spools (220 yds), large spools (1,422 yds), and cones (6452 yds). 40wt is used the same way as 50wt; machine piecing and quilting. 40wt thread is actually the most popular thread for machine embroidery! It’s great for quilting or top stitching as well. Spool sizes: small (164 yds), large (1094 yds), and cones (5140 yds). 28wt is great for machine work including serging and quilting, but also great for handwork such as cross stitch and hand piecing and hand quilting. Spool sizes: small (109 yds), large (820 yds), and cones (3609 yds). 12wt can also be used with machines and for hand work. The thickness will give your project a bold look. It can be used in sergers, for machine embroidery, and machine redwork. It’s great for cross stitch or back stitching, hand embroidery, and hand quilting. Spool sizes:small (54 yds), large (356 yds), and cones (1931 yds). 6 Stranded AuriFloss is also available, which is perfect for all sorts of hand work! Cross stitch, embroidery, even tatting! The floss comes on a cute wooden spool with 18 yards! Due to its popularity among quilters, many fabric designers have taken to creating their own collections of colored Aurifil threads to match their current fabric collections. Pink Castle carries Design Boxes created by Allison Glass, Tula Pink, and more! 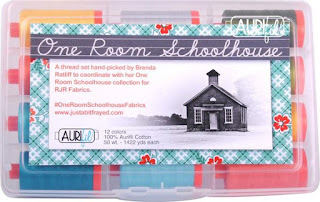 Our very own Brenda Ratliff (Justabitfrayed) has created a collection of 12 large spools for her new line One Room Schoolhouse. We have used the 50 wt. thread from her design box to create beautiful embroidery that matches the fabric line perfectly! Large Design Boxes include twelve large spools of 50wt thread. Small boxes include ten small spools. 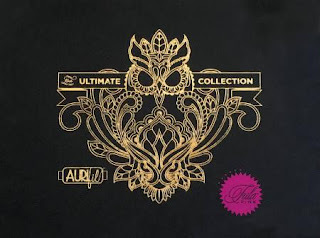 Special editions, such as Tula Pink’s Ultimate Collection (pictured above), may come in different sizes and amounts. Some brands of threads will shed as you sew with them, these typically use a shorter staple cotton when being made or don't go through the mercerization process. 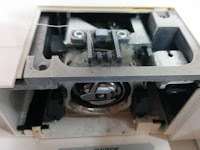 The friction of the thread rubbing against the needle and other metal and plastic parts of the machine is too much for it, causing bits to shed off here and there, causing the thread to lose its strength (and sometimes even break). This shedding will also cause your machine to become dusty long before it’s due to be serviced and cleaned (which should be once a year). Dust can quickly turn into lint that gets in the way of the moving parts of your sewing machine. Aurifil threads don’t shed like lower quality threads. Your sewing machine will stay cleaner for longer and will be less likely to need to be fully serviced each year. As a company that cleans and services sewing machines in-shop, we have been able to tell the difference between a machine used with threads bought at a big box craft store versus the Aurifil thread we sell in our family owned shop. Also, feel free to visit Aurifil's Website here.